Surfboard maker Juan Rodriguez; at right, a One World Rodriguez board. 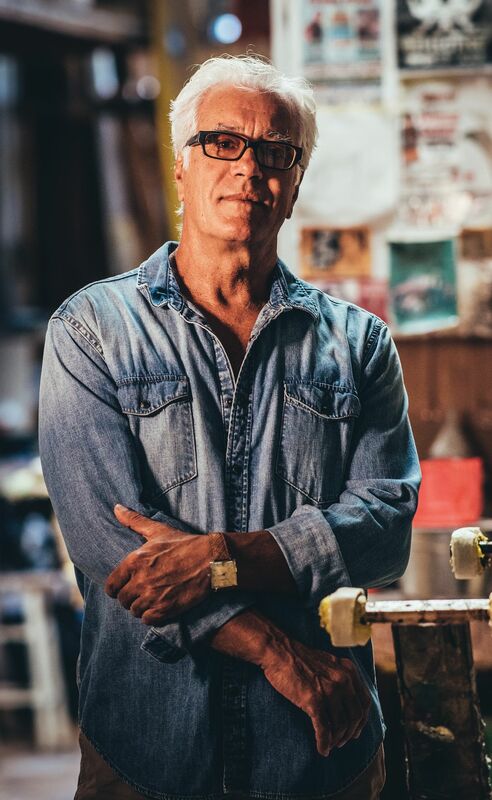 That doesn’t mean he’s quitting anytime soon, or planning to close One World, the popular surfboard crafting shop he’s operated out of a south Sarasota warehouse for three decades. Rodriguez is a world-renowned surfboard shaper, someone who sculpts boards and then “glasses” them by applying a resin coating. Most of his boards are made here in Sarasota, in a tall garage with long planks of wood leaning against the walls and a colorful drip castle made with leftover resin that comes up to his waist. Rodriguez is tall and athletic, with baked skin and a short crop of bright white hair. He ambles about the space in flip-flops, khaki shorts and a V-neck T-shirt, answering calls on a flip-phone. On his desk sits a book stuffed with old snapshots of him catching waves and a copy of The Complete Idiot’s Guide to World Conflicts. A cabinet stores his trophies and other mementos. A Sarasota native, Rodriguez learned his trade in high school, when he got a job at Economy Tackle repairing busted boards for local surfers. Today, surfing is a global sport, with expensive brands, televised competitions and lucrative endorsement deals. In the 1960s, it was a countercultural phenomenon that squares knew little about, with anti-establishment bona fides that appealed to Rodriguez. He caught his first wave off Lido Beach, surfed often in the Dominican Republic, where his father was from, and spent his weekends surfing up and down Florida’s east coast. After graduating from high school, he hitchhiked to Encinitas, California, where he landed a job as a board polisher in a surf shop. In the early 1970s, he moved back to Sarasota and began making boards on his own. His board-making philosophy is simple: “You don’t cut corners.” It’s a perfectionist streak that made him a legend in the world of surfing. Larry Fuller, a surfboard maker in California, calls Rodriguez “Juan in a Million.” He says it’s easy to tell when a shaper is committed to the art of board-making or just in it for the money. “I want the guy with the same heart that I have,” he says. “Juan is as good as anybody I’ve ever seen.” Rodriguez’s work has been featured in national magazines, art projects and oral histories, and his brand earned a mention in a Michael Connelly novel. Legendary competitive surfer Kelly Slater has called him one of the best shapers in the world. Rodriguez may have been drawn to surfing because of its countercultural connections, but he’s also a savvy entrepreneur with a sharp eye for new trends rolling in. “Everything’s cyclical,” he says. 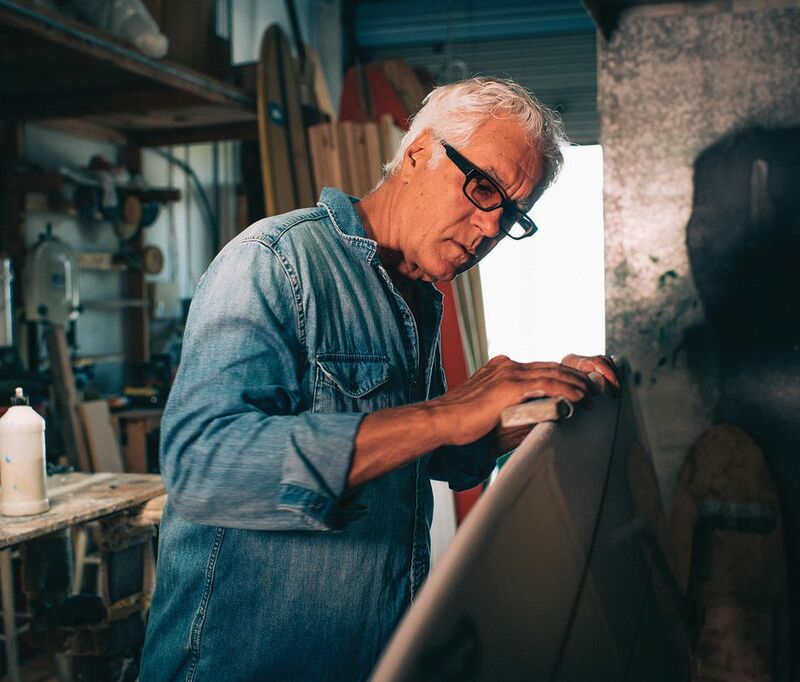 “Hardly anything is really new.” When skateboarding made a comeback in the 1970s, he began making skateboard decks, and he later began crafting skimboards and stand-up paddleboards. He also makes trophies for surf competitions, miniature wooden boards that serve as display shelves in retail shops and replacement fins for others restoring vintage boards. His latest work has focused on using rare, sometimes ancient wood to craft surfboards that can be ridden, but are more often hung as art objects. One project had him working with the root ball of a 3,000-year-old sequoia. “When I was cutting into the wood and the air was escaping, it was like opening a mummy’s tomb,” says Rodriguez. “The air hadn’t been disturbed or breathed for a couple thousand years. I took my shirt off and was shaping it with just my shorts on and letting that dust cover me.” He’s still crafting redwood boards. 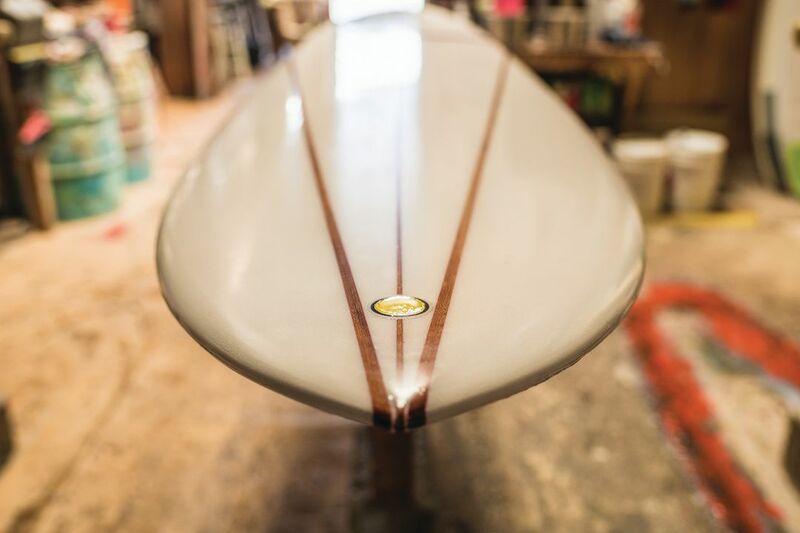 A normal custom surfboard from Rodriguez costs between $500 and $1,000. A sequoia board starts at $1,500 and goes up. For Rodriguez, the appeal of surfing is simple. “People in general want to be a part of something,” he says. “Surfing is tribal.” He’s still friends with guys he surfed with in the Dominican Republic as a kid, and when he travels the world, he often runs into surfers he’s met on previous trips. Other friends have fallen by the wayside as careers and other obligations stopped them from surfing. “To maintain the lifestyle is hard,” Rodriguez admits. Early in his board-making days, he established his own routine: He’d work for 90 days straight, no weekends, and then take off 30 days for a surf trip. “For society, your level of success is usually measured in dollar signs,” Rodriguez says. “I’ve got experiences that you can’t buy."